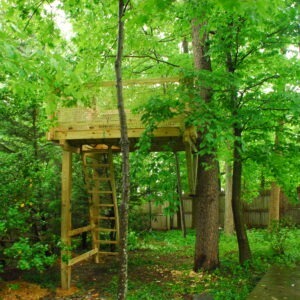 This tree platform created an outdoor elevated playspace with a view, and a couple activities underneath. The monkey bars and the swing were the two non-negotiable requests from the kids. We also fit a pulley and bucket on one side next to the tree trunk. The ladder through the trap door is the only way up and down. How Much Does this Tree House Cost? While treehouse costs vary greatly and each project is unique, we understand your need to have some idea what each project in our portfolio would cost to build. 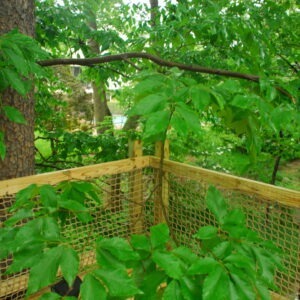 Please see our tree house pricing page for a description of the factors that go into each quote. 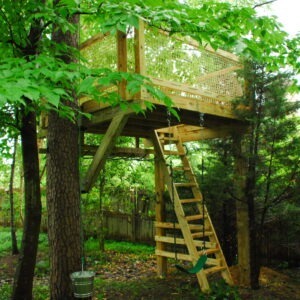 This tree house as shown would cost between $9000 and $15,000. Please feel free to contact us to discuss whether your project would fall on the high end or low end of this range.